News Release – ORANGE COUNTY: The numbers are in and it’s official. The Harvest Club Orange County has gleaned 11,640 pounds of fresh fruits and vegetables from residential areas and local farms throughout Orange County during the month of March. Once harvested the freshly picked fruits and vegetables are dispersed amongst the organization’s local network of 75 emergency food distribution pantries in Orange County. The Harvest Club is a unique way for Orange County residents to combat hunger within their community. It is a residential gleaning program that harvests excess fruits and vegetables from the backyards of Orange County’s residents. Since the club’s inception over 323,141 pounds of fresh produce that would otherwise be wasted have been harvested. In 2016, 435 volunteers donated over 1,600 hours of their time to help pick 82,000 pounds of fresh produce. To put into context just how high that number is, the second heaviest year was in 2014 with 52,000 pounds picked. Most importantly though, those 82,000 pounds provided 210,700 servings of fresh produce. by liking us on Facebook, following us on Twitter, or by signing up for our e-mail club on our website www.theharvestclub.org. How do you increase community involvement in the consumption, embrace, and production of local food? How does a city, or county, benefit from the development of community and school gardens? What is the role of a farmers’ market in community development beyond offering a location where farmers can sell direct to the public? What benefits do farmers’ markets confer to the community and economy? Sonora Ortiz is the manager of the Downtown Santa Ana Farmers’ Market, a culinary and nutrition educator, farmer, and future astrobiologist. They work all over the world but are currently back home in Orange County to help transform the local food system. Sonora draws from permaculture and Transitions principles to guide their work with an emphasis on accessibility and community collaboration. 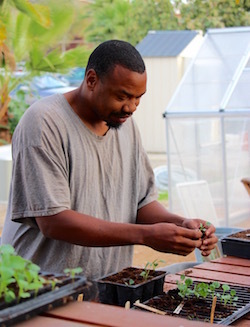 Rickey Smith is founder and principal of Urban Green LLC, a social entrepreneurship dedicated to restoring, developing and promoting “green space” within the communities it serves. 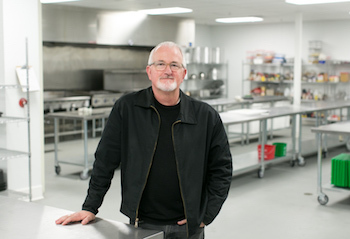 Urban Green LLC was designed upon Rickey’s philosophy of Circular Synergy, which seeks to establish a CLEAR path connecting the inter-disciplines of Cuisine, Land-use, Environment, and Architecture into Renewable cycles of self-reliant communities. As a youth, Rickey worked the land upon his family’s rural property in Wartrace, Tennessee. He received his Bachelor in Business from University of Tennessee, Knoxville and a MFA in Visual Anthropology/Cinema from University of Southern California.